When we last posted a month ago, we were seeing an increase in Sally’s seizures caused by the cancer treatment and had started her on a new drug called Depakote. After just being released following an unexpected 5 day hospital stay, we’re now counting on this med to stop a downward trend that we’re seeing in Sally. Shortly after our last blog post we all headed down to Florida to see Grampa and Grandma Kabel in Sarasota for a 10-day Thanksgiving vacation. With Sally starting school, we haven’t spent as much time with her so could only go by what we saw on weekends in regards to her seizure activity. 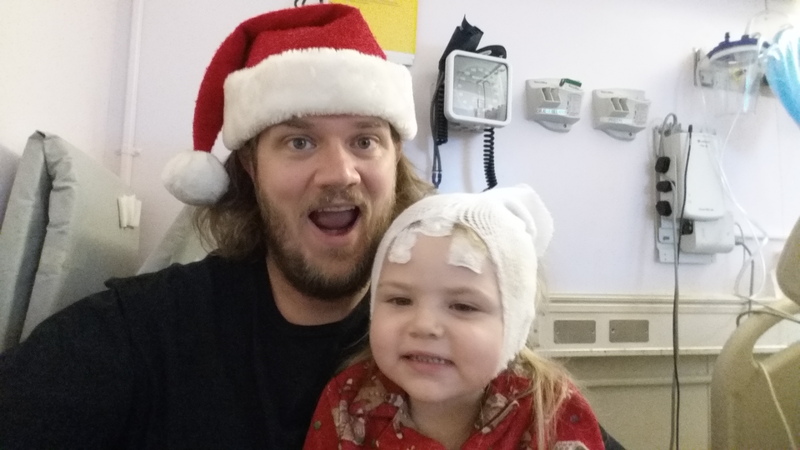 With the increase we were already seeing, Nicole decided that we should track all the activity we saw so that we could share that data with Dr. Devinsky’s team prior to an at-home EEG we had scheduled for the week before Christmas. As the days went on, we were surprised to not only see how much activity she was having, but new behavior that we hadn’t yet seen. This is two days of activity alone. After tracking her for several days, we realized she was having 50+ myoclonic jerks on most days. We also saw different kinds of activity which included the myoclonic jerks we were used to, staring spells, shaking hands and spasm-like actions where her body would tighten and her arms would raise up and shake. The last type are scary, when they occur and she’s standing she loses her balance and can fall. This short video shows an example of one. If you notice she’s continuing to eat, however we now know that only part of her brain is functioning so she is likely not fully conscious during this period. We called this behavior into the doctors and they told us to increase her Depakote dose as an initial step. Sally took long naps while in Florida, very unusual for her. 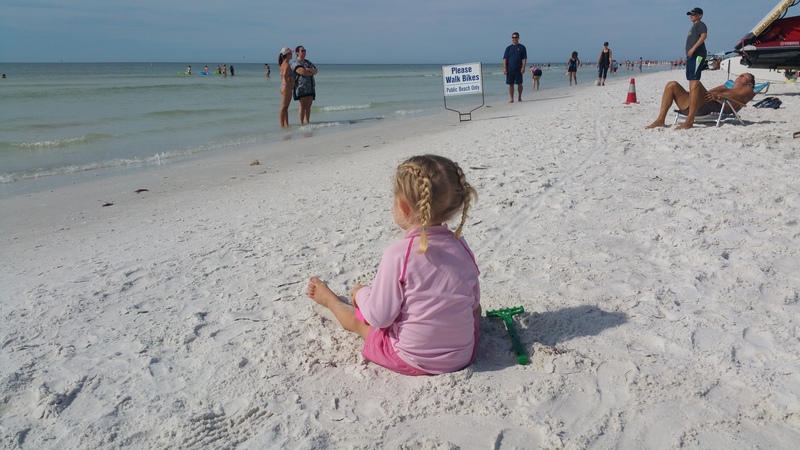 We returned from Florida and followed up with Dr. Devinsky’s team, they were concerned enough with what we were seeing to get Sally admitted for a full video EEG as opposed to the at-home one we were scheduled for the following week. There are only a handful of beds available at NYU that can handle video EEGs, so we were on call waiting for a bed to open up. In the meantime, Sally was developing a bad cough and two brief fevers at school. We took her to her primary doctor who was concerned that Sally had developed pneumonia, so she was started on an antibiotic. Strangely enough, we saw a brief decline in her seizures shortly after. Finally, after six anxious days of being on call we were admitted into NYU on Thursday night. For the first 12 hours, few seizures were seen on the EEG and doctors initially thought Sally could go home on Saturday. Nicole and I were baffled, we’d seen excessive seizures for weeks now and couldn’t explain why they all of a sudden stopped. We wondered if Sally had been battling an infection since starting school and that treating it finally with the antibiotic was reducing the seizures. That would have been a best case scenario, but sadly wasn’t to be. That afternoon we began to see her seizures again. We also saw a drop in her blood pressure and nurses struggled to get blood out of Sally, which is highly unusual. It required many pokes in different parts of her body, very painful for Sally bringing back memories of the day she was diagnosed with cancer. 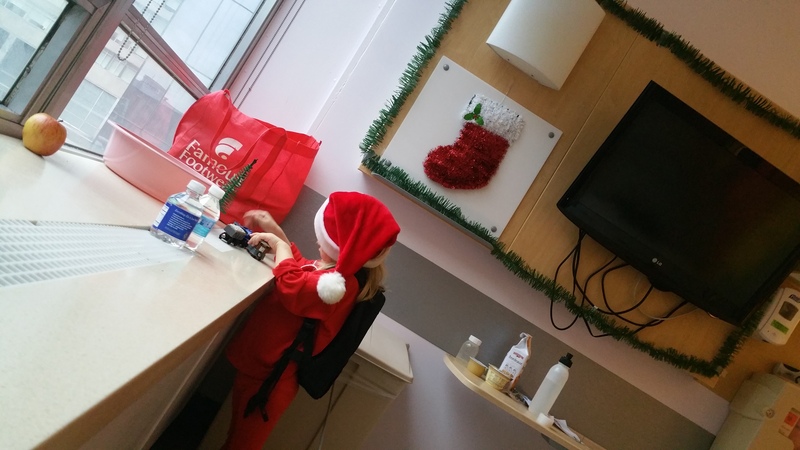 We had to keep her very active in the hospital, it was challenging as you were limited to the room and the playroom and tethered to a computer the entire time. On Saturday morning, fully expecting that we were going to be discharged, the doctor on rounds informed us that we’d be staying admitted. They were surprised to have seen a sudden increase in Sally’s seizure activity and were very concerned at what they were seeing. They also informed us that Sally was likely having seizure activity at night, something we hadn’t seen in months. There had been nights recently where we’d find Sally in different parts of her bed, one night we found her sleeping on the floor. We’re told that this was likely caused by seizure activity, obviously very concerning. There was also no decrease in the slow spike wave pattern in her sleep that we’d been seeing since her first EEG back at Cornell. The doctor decided to increase her Depakote dose further, being that the drug usually has a lot of success with the generalized seizures like what Sally was having. Depakote can also cause low blood pressure, which may explain our challenges with drawing Sally’s blood. Another side effect of the Depakote is drowsiness, which we have seen in Sally who had fallen asleep at school for two hours recently, and who was taking long naps in Florida. On Sunday, he decided to keep her admitted until Monday when Dr. Devinsky could weigh in on the results. We tried to make the best of being admitted during the Christmas season, our favorite time of year. 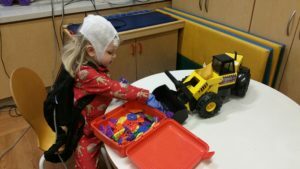 On Monday, Dr. Devinsky confirmed that they were seeing around 30 seizures a day on the EEG, likely fewer than we were seeing at home due to less activity from being in a hospital. He agreed that the first action to take would be increasing her Depakote to a therapeutic level. This will require us to incrementally increase the dose over the next month, and go in for blood tests to check her levels. He said we could also be released from the hospital and do this at home since it would take a few weeks to measure any impact. We can’t express how badly we are hoping this works. Another doctor on the team visited before leaving and shot us straight, saying that Sally is on an obvious downward trajectory in the direction of a Lennox-Gastaut Syndrome (LGS) diagnosis. This would be a worst-case scenario. 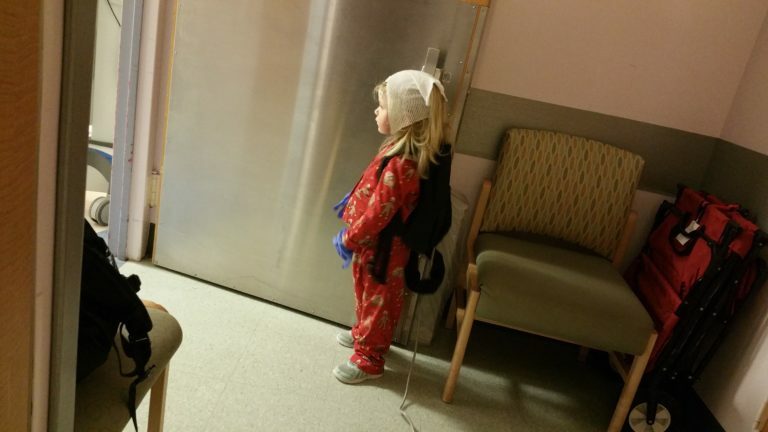 We first mentioned this condition when we had the EEG at Cornell as it appeared as a possibility in her diagnosis. You can learn more about it here, but is a very serious form of epilepsy that is extremely difficult to treat and has a poor long term prognosis. We’ve mentioned before that getting Sally’s seizures under control quickly is important, this is why. Another treatment option is steroids. One of Sally’s oncologists once commented that steroids should never touch Sally’s body ever again due to the effects she experienced on cancer treatment, however we may not have a choice. Due to Sally potentially having pneumonia, it’s not an option right now as the treatment will significantly lower her immune system. So for the next month, we’ll focus on the Depakote and are praying that it’s successful, we’ll have to watch her very closely and work with her school to ensure they are as well. We also want to be prepared if Sally does require steroids. She will need another bone density scan to see if her bones have continued to recover from the treatment. We also need to visit her pulmonologist to ensure the pneumonia is gone and touch base with Sloan Kettering and get their insight into potentially using more steroids. We’re still digesting the news, and going back into battle mode knowing that we have an uncertain outcome. For now, we’re doing our best to continue living in the moment and enjoy the end of the Christmas season. We look forward to spending time with friends and family over the next two weeks and a slower pace than we’ve had the last several months. It’ll be a nice distraction, especially for the boys who have watched Sally’s seizures worsen, they’ve already seen their sister go through so much. Sally’s buddy William is having an especially hard time with it, asking a lot of questions and expressing his worries. To be honest, we’re all a bit scared, when we got home from the hospital we saw Sally have a seizure while standing and almost fall face forward. We feel like we’re up against a clock, but know we need to focus on what we can control. 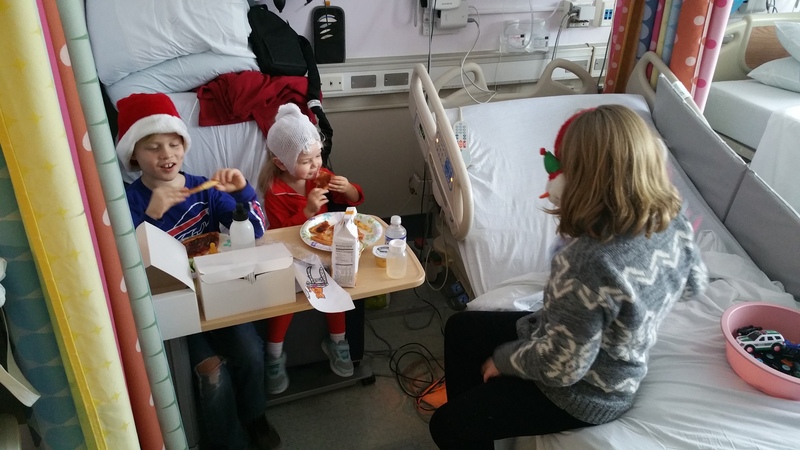 She was excited to see Thomas and William after three days, hospital stays are always tough on the kids. We want to wish everybody a Merry Christmas and Happy Holidays, we hope 2017 yields good results for our little Sweet Sally Sunshine. Please keep Sally in your thoughts and prayers. So sorry for sweet Sally and all of you to be facing such uncertainty. Best wishes for the best Christmas! Sending love. I wish your family a very Merry Christmas and Happy New Year! 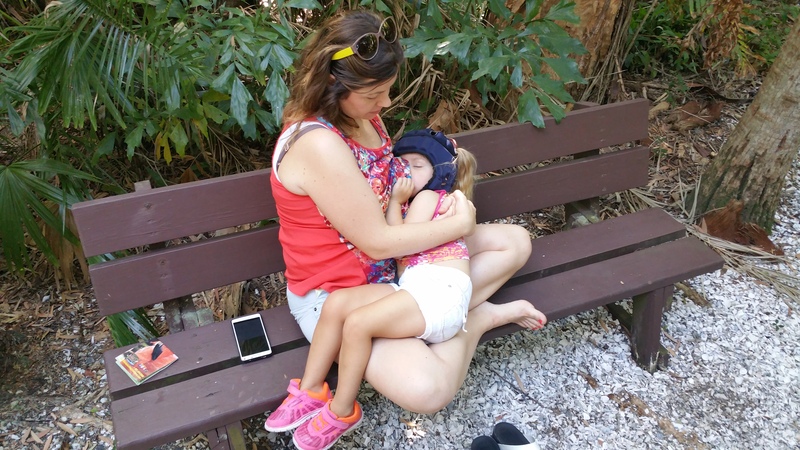 Most of all I want your little girl to be seizure free or at least under control with no side effects. Prayers for Sally. Wishing you all nothing but the best the holidays & New Years has in store for you and Sweet Sally … sending a gazillion positive thoughts and prayers !!❤️???❤️???❤️???❤️??? Prayers gor your little girl. My son had infantile spasms which is the same thing but in infants, he was treated with steroids, but also with a drug called vigabitrin. Ask the doctors about it. Depakote made his seizures worse and he ended up being allergic. Best of luck and will be praying for her. Prayers for all of you. Hoping you have a better, easier time in 2017. I am so sorry to hear that our sweet Sally is suffering these seizures. 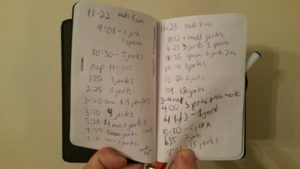 I have followed your blog for over two years and feel like I know you and love Sally. I will pray for her healing during this season of miracles. May God bless you all and give you the gifts of hope and peace at Christmas. Merry Christmas. It breaks my heart to hear of these struggles. I hope they can find the right dose to stop these seizures. I pray your family can enjoy a peaceful holiday together. So sorry to hear this news about Sally. We will keep Sally and the family in our prayers. Enjoy the moment, enjoy Christmas your most favorite of holidays. Wishing you a blessed Christmas and the best in the New Year. Prayers for you and your family as well as the doctors to find an easy solution for dear Sweet Sally. Merry Christmas! Wishing you all good things in the New Year! Prayers for Sally and the doctors treating her to guide them in the right direction to help her and control her seizures with little or no side effects. Wishing your family a Merry Christmas and healthy New Year. I will be praying for her and all of you. Thank you for the update, Matt & Nicole. Your beautiful, brave family has never left our thoughts and prayers here in upstate NY. May Santa bring you lots of “being silly” moments and a 2017 filled with hope! Sending our love to our baby cousin. She is in our thoughts and prayers all the time! Please give her a big hug and kisses from her cousins on Long Island. So sorry that Sally – and all of you – are having such a struggle. Know that we will keep you in our prayeers and hope that you are able to enjoy a great Christmas and and a happy and healthier 2017. Will continue to keep you guys in my prayers that God gives you the strength to persevere in “battle mode” and soon you can go back to “fun and silly mode”– God bless and Merry Christmas! May the blessings of Christmas remain with you throughout the New Year. I’ll continue to pray for Sweet Sally Sunshine& all of you as well. Please try Cannabis Oil (CBD Oil also known as Charlotte’s Web) and also Frankincense. Praying for your sweet little daughter!!! Jill – Sally has been on it for two months, and has not worked. Our doctors, who fully support its use, said it can both help and hurt seizures. Kabel Family, sorry on this sad new of our little friend . Have requested all my Prayer Warriors to keep up the prayers . Sally has been on Charlotte Web for 4 months and has gotten worse. We are pro cbd, but it is not working fir her. God bless and keep you as you deal with all of these new challenges. So many people are praying for you , Sally, and hoping your new treatment will help you to feel better. Merry Christmas & hope it was wonderful for the Kabel Family & praying that 2017 will be a miracle for our Sweet Sally!!!! Dear Lord, coming to you again for your love & protection of your daughter Sweet Sally. Wrap your loving arms around her & comfort her from these seizures & pray that this new medicine will help her. Please continue to guide her medical team. We know your hands are guiding everyone. send her Guardian Angel San Rafael to help with the seizures. But we know this is all in your time!!! also please watch over Mom & Dad and her brothers during this healing journey. Love you Lots Our Sweet Sally!!!! Hugs and kisses for you guys. We continue to pray for Sally and hope the Depakote will work. Stay strong and we know that This year Sally will overcome this bout! God bless you guys youre all in my prayers every day.